I love the holiday season! I know, I know…everybody does, but as email marketers, the holiday season is the time of the year that we really get to shine. As subscriber’s inboxes get fuller, wish lists get longer and budgets get tighter, it’s our chance to do what we do best – make memorable emails. Emails that spread some holiday cheer, break through the clutter, grab our subscribers’ attention and ultimately help drive a sale. 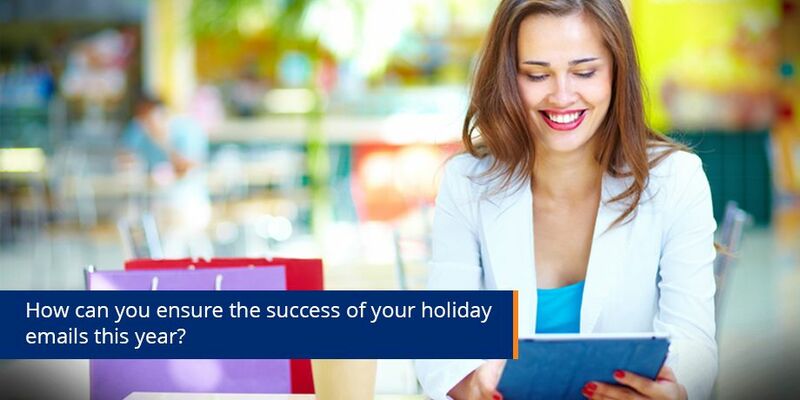 For a lot of businesses, the holiday period, which in South African runs from mid-November to early January, is one of the most profitable times of the year. While this period is often dominated by retailers trying to maximize on sales, it’s safe to say that all businesses shift their focus at this time of year. They all incorporate holiday themes and trends into their emails, even if it’s only to help create long lasting relationships with their subscribers. 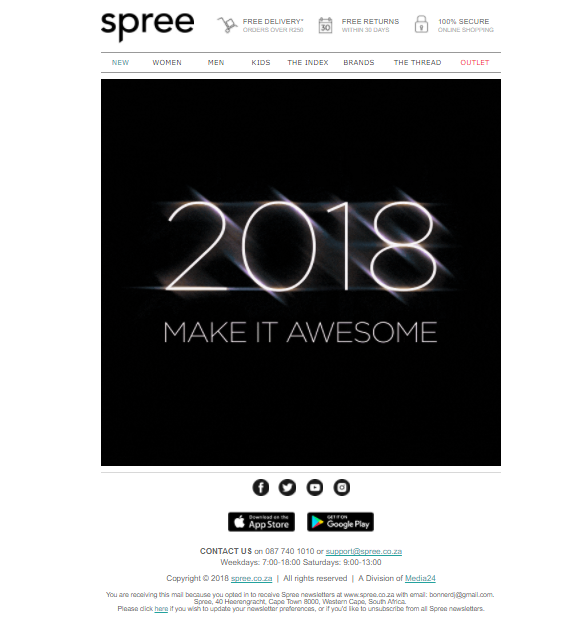 It was interesting to note that holiday emails this past year (regardless of whether the email was sales orientated or not) were characterized by BIG images and BOLD copy. Below are just a few of my favorite emails that landed in my inbox over this holiday period. Emojis proved to be a great way to get emails to standout in the inbox this holiday season. With most free account and mobile devices rendering these emojis and symbols in color, the eye can’t help but be drawn to them. 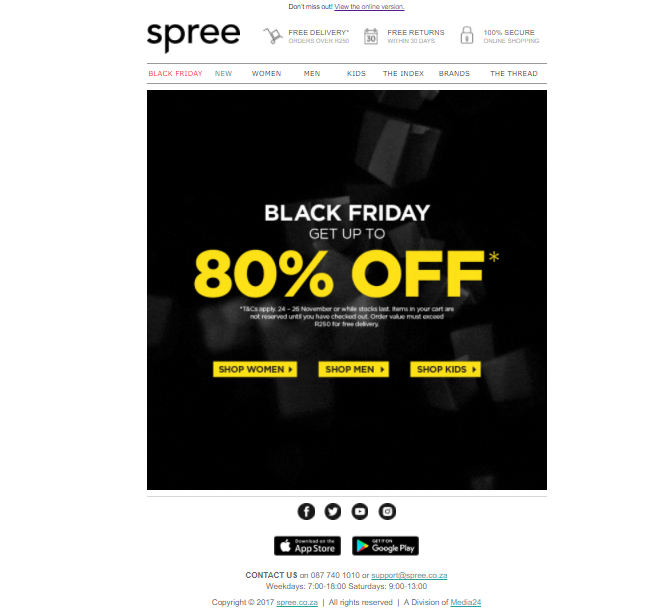 According to dot.mailer the average consumer received 18 Black Friday emails. 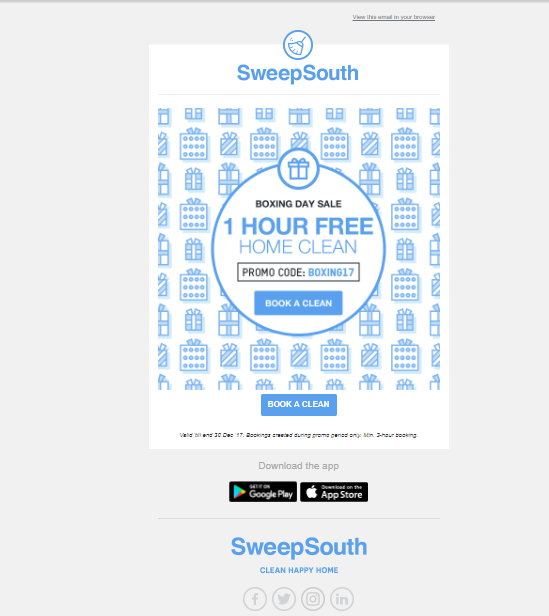 Clever subject lines detailing the offer within, as well as direct, easy to understand offers, combined with some cool GIFs helped make these emails memorable. Subject line: Dori-Jo, our 80% off Black Friday is live! Click the email images to view the original images. With subscribers receiving multiple emails a day, it’s important to ensure that your email is opened. A great way to do this, is to tease subscribers about what’s next – this keeps them coming back email after email to see what deals are available to them. 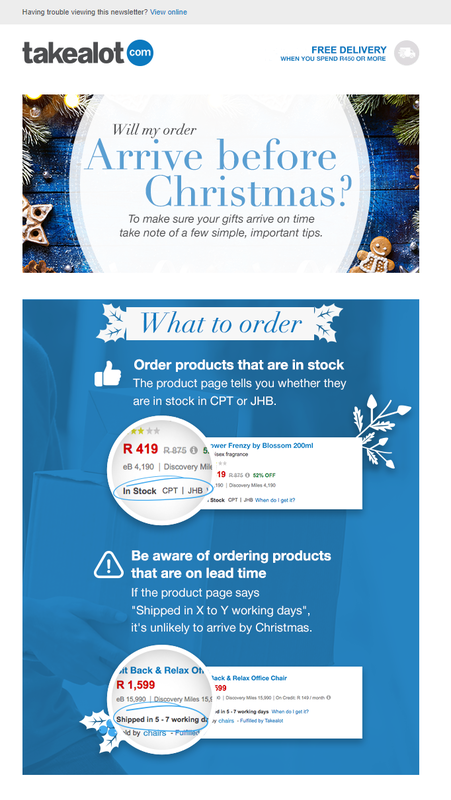 Netflorist did a great job of encouraging subscribers to keep coming back for more. It did this by including a “10 days of Christmas” countdown. Everyday, new and different deals were made available to subscribers for purchase. By concluding their 10 day countdown by the 14th of December, everyone was able to get their shopping done before the Christmas rush. You need to ensure that your customers have all the information available to make well informed purchases – this helps avoid buyer’s remorse and unhappy customers. The Take-a-lot email was a great informative and educational email that ensured customers knew what they needed to do to get their holiday purchases delivered by Christmas. This email from Bobbi Brown cosmetics used a GIF to help create a sense of urgency and educate subscribers – they were able to encourage subscribes to finalize their purchases ‘today’! Who doesn’t like a bargain? During the holiday period everybody is looking for the best deals and the lowest prices. Using vouchers or coupons in emails is a great way to convey a tempting deal. While most emails are aimed at making sales at this time of year, you need to remember that your subscribers are just like you and me, so a good wish goes a long way in making the holidays special. I wish you all a happy and healthy 2018, filled with memorable emails! Dori-Jo studied a Bachelor of Business Administration in Marketing Communications. She joined Striata in 2009 as an Account Executive and has taken every opportunity to expand her skills and experience in digital communication. In her current position as Account Strategist at Striata, Dori-Jo is responsible for researching and proposing solutions that add strategic value to our client’s marketing efforts by significantly improving the customer experience. 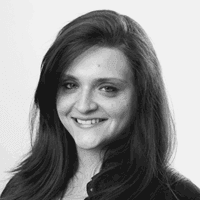 Her years of running email marketing operations and execution means she is also a sought-after advisor to Striata’s email marketing production teams.